After Pearl Harbor, the P-400 was deployed to training units, but some saw combat in the Southwest Pacific including with the Cactus Air Force in the Battle of Guadalcanal. Though outclassed by Japanese fighter aircraft, it performed well in strafing and bombing runs, often proving deadly in ground attacks on Japanese forces trying to retake Henderson Field. The P-39 / P-400 kits from Eduard first appeared back in 2000, with the first edition this is the 14th release. This is probably one of those kits which established Eduard as the manufacturer we know now. I have built a P-39 scale model from one of the previous releases - the P-39Q "Devastating Devil" and it was mostly trouble free build with only minor issues. Inside the box there are two identical kits. Each is comprised of three dark gray plastic sprues and one transparent sprue. In addition to that you get one pre-coloured photo etched fret and three unpainted frets and clear acetate film for the gunsight reflector. Paper die-cut masks are also included in the kit as well as two sets of resin wheels. What is missing is the lead nose weight that was included in the previous releases and that is disappointing. Here we have the usual Eduard instructions - A4 premium paper, full color camouflage schemes and two color assembly guide. On the first page there is some history and technical data about the airplane and a profile picture of marking option H, why the last marking option is on the first page I don't know :). On page two there are the parts and paints call-outs. Paits are given in Gunze's Aqueous and Mr.Color range. Important: Having so many marking options complicates the assembly guide. My advice is to make a note on the instructions which marking option you are building wherever there is difference in assembly procedure. Big omission in the instructions is the fact that they state that weight is needed in the nose section but dont say how much. The decal sheet provides 8 different markings options. The decals are in register with nice color and great definition. They are very glossy but may be a little bit thick. Given the fact that they are printed by Cartograf I am pretty sure that they are among the finest. P-400, BW151, 67th FIS / 347th FG, Guadalcanal, Oct 1942. P-400, BW146, 347th FG, Guadalcanal / USA 1944. P-400, BW146, 67th FS, New Caledonia, May / June 1942. P-39D, 12th FS / 18th FG, Guadalcanal, Spring 1944. P-39F, 70th FS / 347th FG, Fiji & Guadalcanal, Late 1942 / Early 1943. P-39F, Panama Canal Zone, Late 1942 / Early 1943. P-39K, 24275, 70th FS / 18th FG, Guadalcanal Spring 1943. P-39N, 42-18799, 12th FS / 18th FG, Salomon Islands, 1943/44. Sprue A contains the fuselage halves, horizontal stabilizers, some cockpit parts and other misc. parts. Sprue B holds the wings assembly among other bits like the external fuel tank and the front wheel well walls. Sprue C is dedicated to everything else - all small bits ant pieces of the undercarriage, propellers, antennae etc. On the clear sprue there are the cannopy, doors, gunsight, a light and a bulkhead. In total there are four photo etched frets one of which is pre colored, rest are standard - unpaited. Quality is as usual from Eduard and these details will boost the finished scale models appearance. The masks are also warmly welcomed addition and will help you mask the canopy, the wheels and walkways. The resin wheels are the icing on the cake. Two different types are provided (one of each type). I will start the detail review with something that disappointed me - the clear parts. I am sure that when I built the 2001 release this issue was not present. The problem is that the clear parts are not that clear, except from the front window. To all other windows there is some sort of "orange skin" effect which distorts the image behind heavily. I really hope that this problem is in my sample because high quality is what Eduard is most known for. The photo etch frets are nicely done and are mainly focused on the cockpit and the undercarriage. There are also meshes for the engine air intakes and cooling vents. The two smaller frets are covers for the wheels, but give the resin wheels I doubt that many of us will use them. Talking about the resin wheels, they are simply amazing, great tread detail, rims are very nice and tires are given weighted appearance. There are two types of main and nose wheels available so again care must be taken with the instructions. With the kit being 15 years old to date I am not going to discover the hot water by saying that it is exquisite. Panel lines are deep enough to hold washes yet crisp, fine and consistent throughout the model. Surface detail is also well defined and flash is not present. The ribbing texture on the control surfaces is delicate but prominent feature. I have to say dough that on my sample some sort of blistering was present. I don't know weather this is due to the age of the tool or something else but its surely unpleasant. To conclude that review I will say that as many of Eduard's kits, this one is of a real good value. 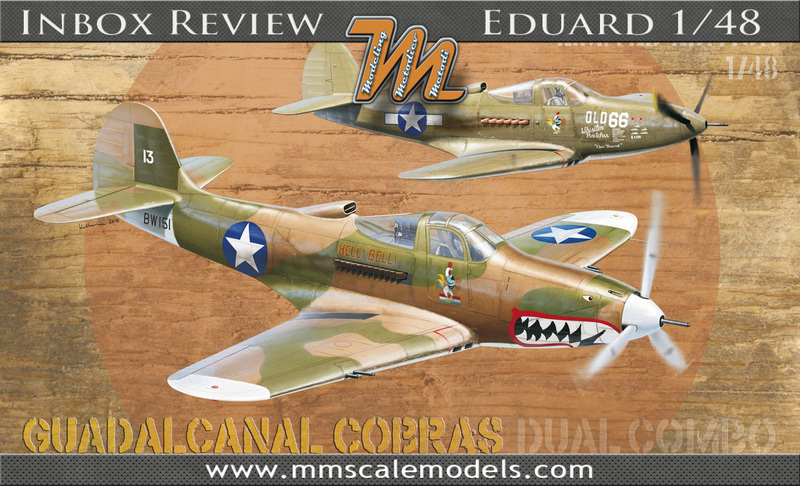 And I would recommend it to everyone that would like to build a scale model of Bell P-39 or P-400 Airacobra. Please check my facebook page in the upper right corner of the site and give me a LIKE. Thanks for reading this article, I hope you liked it. Comments are wellcome.